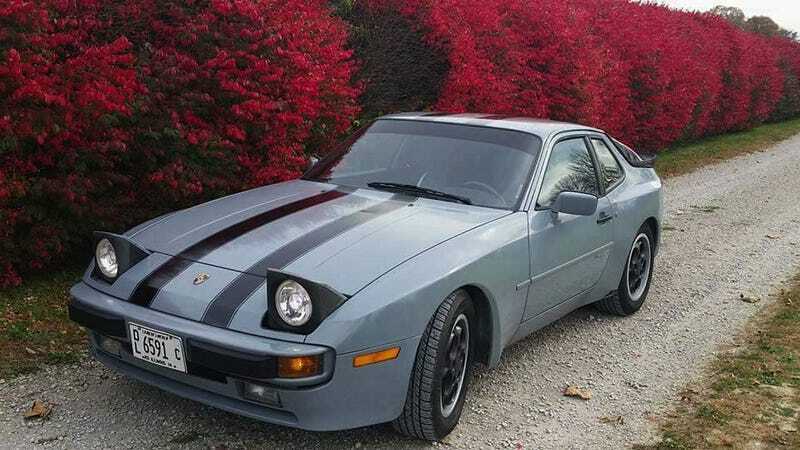 For $3,950, Could This 1987 Porsche 944 Be The Real Deal Working Man’s Porsche? A Porsche executive was once asked why his company didn’t offer an entry-level car, to which he responded “we do, it’s called a used Porsche.” Today’s Nice Price or Crack Pipe 944 is a used Porsche, but will it’s price let it level up? Here’s a fun tip: when cooking, stick a toothpick in the middle of baked goods to check for done-ness, if it pulls out clean, it’s done. The general consensus about yesterday’s Chevy-powered 1968 Mercedes 250se was that it wasn’t done. And no toothpicks were harmed in the making of this decision. Half-baked was also seen as a total no-go at its price, and the car fell in a 60% Crack Pipe loss, evening up the week. Do you remember back on Wednesday when we had that high-miler VW Scirocco to examine? Its seller averred that the Scirocco was “the working man’s Porsche” and we all had good fun dissecting that assertion. What we have today is what I think is really the working man’s Porsche. That’s because the 944 can be had—and generally maintained—on a blue collar salary, and it’s rationally a real Porsche. This 1987 Porsche 944 is offered by what appears to be a consignment shop and is located at a dealer that, in fact seems to be a small collection of semi-rural buildings surrounding a dirt road. That dealer—B&W AUTO SALES—has a Facebook page that notes in one post that owed to health issues, they are sadly going out of business. Yes, the whole thing seems sketchier than an email from a Nigerian Prince, but the Porsche looks intriguing enough to investigate. The car is a post-update edition, so it has the later dash and the better handling suspension. The body looks to be in decent shape, although the grey paint on it is a bit lackluster in presentation. That’s fancied up a bit with a pair of black stripes and black-painted phone dials, so all is not lost. Some apparent overspray on the headlight cans and wheel wells indicate this may in fact not have been its factory hue. I know, Sherlock-Effing-Holmes. A peak under the hood indicates that the car may have at one time been silver. Other body issues include a few dings and scrapes here and there, as well a turbo badge on the back, which makes promises the engine can’t keep. That engine is the 2.5-litre 150-bhp four (the ad says 2.8 but there was no so such thing) and it is said to come with a refreshed timing belt and water pump. It also comes with the evidence that someone at one time got crazy with a blue Sharpie in there. People, get a non car-related hobby, okay? Behind the big four is a five-speed manual and that has a new clutch. The brake master cylinder is likewise refreshed and a set of tires holds everything up. The old however, outweighs the now. The interior as example is a bit of a dog’s breakfast, with a cracked dash cap and a multitude of parts out of 944s of different colors. The seats must be pretty heinous too as they’ve been gimp-wrapped in Pep Boys seat covers. Regardless of how rough it may be in there, the seller says the car has served as a daily driver for three years and “runs and drives GREAT!” It’s apparently been running and driving for only 88,000 miles. Okay, so it’s a 944 that needs a little prettying up, but seems sound otherwise. It’s also at a place that claims they’ll be shutting the doors when the last car is sold. Is that not enough incentive to give this car some consideration? I thought so, now let’s look at the price and see if that seals the deal. The seller is asking $3950 for the car, and will throw in an ’83 parts car for additional cash should you like a two for one deal. What’s your take on this “working man’s Porsche and that $3,950 price? Does that, or does that not, work for you? B&W Auto Sales via Lindsay’s Wholesale out of Taylorville IL, or go here if the ad disappears. H/T to 6Stringtheory for the hookup!